Welcome to the Crusader Crux! Where we look to see what our Lord Jesus Christ is up to in fellow alumni lives. This issue we meet Christina Nissen. She is a 1986 graduate of Mayer Lutheran High School and currently lives in Farmington with her children; Andrew (17), Lydia (15) and Isabella (13). Her parents are the Rev. Norman and Eunice Nissen. Christina works with patient finances at the Shrine Hospital and has been there for one year. One of the things Christina enjoys most is that she can do God’s work by helping disabled kids get excellent healthcare regardless of their ability to pay. 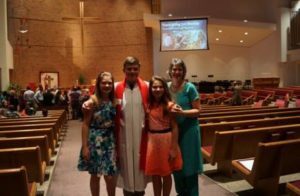 Christina also shares her love of Jesus with her church Shepherd of the Valley in Apple Valley where she teaches confirmation, counts offering and does other volunteering. With three kids, a full time job and doing Christ’s work at her church it’s hard to believe that for 15 years she has also lead the Farmington Service of Girl Scouts and helps out the Boy Scouts. While Christina was with Mayer Lutheran High School she had the unique opportunity to be a boarding student. She has a special place in her heart for that experience and how God lead her to that appreciation. It’s easy to see Christ in this servant’s life and she feels blessed by all His gifts. Mayer Lutheran High School had a pivotal role in Christina’s journey and her choices reflect that. Thank you for your service to our Lord’s sheep, Christina!